Cesc Fabregas many have failed to make the cut to Spain’s final squad for the upcoming FIFA World Cup 2018, but he seems to have gotten over it. The Chelsea midfielder headed out for a family vacation as he enjoyed some quality time with his wife Daniella Semaan and their kids. 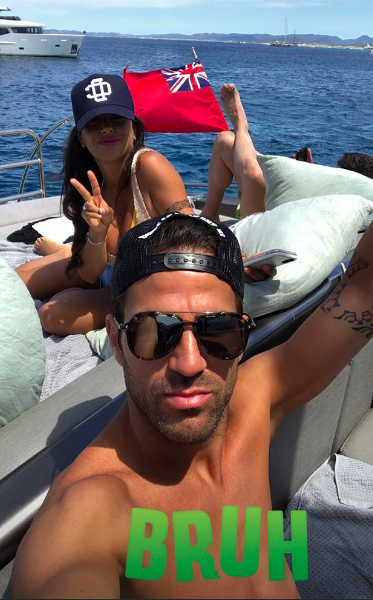 Fabregas also channeled his inner disc jockey by spinning the decks inside the boat as he took to his official Instagram account to share a video. The 31-year-old also shared a couple of photographs soaking up the sun with his family. Fabregas, who tied the knot with his long-time partner Semaan last month, will still travel to Russia as he has been roped in as a commentator for the mega-event, reports Daily Mail. He will be a part of an elite panel comprising of Didier Drogba, Frank Lampard, Rio Ferdinand, Gary Lineker, and Alan Shearer among the others. The main tournament begins on June 14.